While the previous two entries in this series seemed to be disjointed in their writing styles, The Long Mars seemed to iron out some of these discrepancies . . . finally. 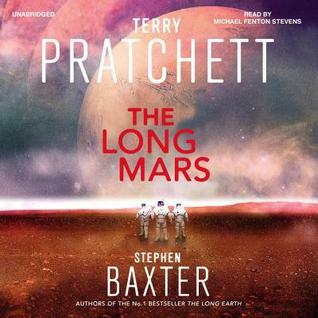 In The Long Earth and The Long War, you could almost pinpoint the sections that Terry Pratchett wrote and the sections primarily written by Stephen Baxter. By The Long Mars, there are still a few moments of Terry Pratchett’s goofiness, but they are few and far between. Consequently, the narrative of The Long Mars seemed a lot more consistent than its predecessors. Of course, this doesn’t necessarily mean that The Long Mars is absent of problems. While there was plenty of exploration of these parallel universes, the ones that were deemed necessary enough to describe didn’t add anything to the plot. In fact, I felt like this book could have been much shorter if these thought experiments that explored how parallel universes would function were cut out entirely. If these momentary breaks in the action were tied to critical moments or conflicts, then I could see their necessity. As they are right now, you could remove almost every one of them and still have the same basic story. The scientist in me did like the broader examination of what to do with multiple universes, like easily visiting Mars. These concepts were touched on in the previous books, but now they felt a lot more fleshed out. Similarly, I felt like the characters were a lot more interesting, especially the dynamic between Sally and her father. Sure, there were probably a few too many plotlines to follow, but at least I cared about the characters now. I’m also not sure if the ending was supposed to mimic its predecessors, as that was one of my frustrations with The Long War: an almost identical ending to The Long Earth. A significant improvement in the Long Earth series, I give The Long Mars 3.5 stars out of 5.